GS Industries Base spacer of trade size 2-inches, snaps vertically and slides horizontally for fast and secured field assembly. This base spacer offers 2-Inch spacing between conduits and features durable PVC construction for added strength. The vertical and horizontal interlocking of this intermediate spacer allows building a strong lock-in duct bank. 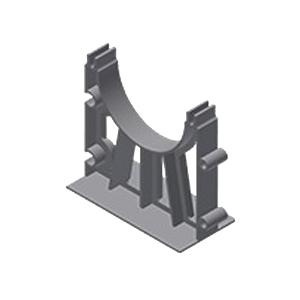 The wide baseplate of this intermediate spacer offers solid support for heavy loads. The completely locked in construction of this intermediate spacer makes alignment of duct bank sections easy. It finds application in EB and DB installations. * Inventory displayed is accurate as of 04/19/2019 01:40 EDT.